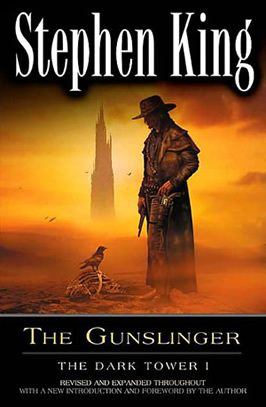 The Gunslinger – Stephen King | The Cesspit. I began to read the book almost a year ago but got sidetracked after about 70 pages, so when I took it again a couple of weeks ago I had to restart from the first page since I had a very vague idea about the part I had read. Not that it got so much better the second time through, the story defies control and one has to struggle to distill from the book some form of logic progression. Reading this, day after day, feels like you never make any progress, which I guess is the point. There’s a direction, a sort of abstraction of the concept of the “quest” in its most absolute form. The endless, ultimate journey toward something that is perceived as the definitive “Truth”. Or better, this is the conceit, the Mac Guffin. Roland, the Gunslinger, on his journey toward a mythical, capitalized Dark Tower. Only that this is one book, part of a series. So for this single instance Roland is chasing after another Mac Guffin, the “man in black”, who, when caught, would hopefully point Roland in the right direction. The starting point is not present. We see this chase when the chase has become a consolidated reality that seemed to go on forever. The beginning is a blur, a movement whose beginning was lost. It starts with a desert that represents the absence of a definite space and time. An infinity whose confines are misty and dream-like. The quest is a journey, but here it seems trapped in a stasis: the longing for something that can’t be achieved, the distance that never closes. I’d say it doesn’t even work as a “tease” because we can’t grasp anything meaningful of Roland himself or the object of his longing. Merely an assumption. You witness obsession without motives. One has to reach the very last few pages of the book to have at least a glimpse of what the tower represents. The story is not one built to entice the reader and follow along. The place is haunted and inhospitable, but it’s maybe in these traits that someone may find some fascination. The introduction written by King himself is the most revelatory part. It explains the origin of the idea, especially its naive ambition. The rest of the book is, at the same time, talented, immature and pretentious. All together in a mix that represents the real quality to find here. There are no restraints typical of the established writer, no control of the parts, but this has the consequence of “freeing” the creativity and let it go wild and uncaring. The writing is powerful as it is naive. A core of talent as wordsmith mixed with the pretentiousness, egocentricity and impudence of the young. It takes itself so seriously that it builds a wall of detachment, not reaching out to the reader or gaining his sympathy or empathy. The place is haunted, all characters being like phantoms of momentary conscience, fading in and out, being themselves lost too and living aimlessly. There’s everywhere, on the characters and the places, a sense of nostalgia. Something missing or forgotten that can’t be pinpointed. Even if nostalgia should be a thing of memory. Everyone is missing something but without being able to remember what it was. Nostalgia of the future. A suspended and undefined state of agony. The scenes are all dream-like, evanescent. Their symbolic meaning more important than the factual one, but at the same time esoteric and impenetrable. The book is filled with symbolic myths but nothing at all is explained or even placed into context. These are shattered lives, like glass whose pieces do not connect anymore. I guess the purpose is to to establish this mythology that will only start to make sense later and in retrospective, when the story will loop on itself. There’s already here the impression that the pattern has been repeated, that these characters are themselves victims that follow trails that are merely their own. Condemned to retrace themselves, only to forget again. It sounds, and is pictured, like a torture. If anything, Roland is the only character who seems to have maintained some tangibility. Of self-awareness. Other characters are all hopelessly lost, unrecoverable. Roland seems the only one who produces a difference, sometimes catastrophically, but still a change or a disruption of that agony. When he exterminates a small town the feeling is one of gratitude for having put those ghosts out of their misery, but at the same time he certainly doesn’t win a sympathy in the reader. Roland is himself haunted and hallucinated way beyond any hope of recovery. We have no insight and so one cannot sympathize or understand. This first book works merely as a framework and I’m sure the character will grow toward something more human later on, in this first he stays obscure and maybe for this reason vaguely fascinating. A twisted, black anti-hero that plays maybe too much with being against the convention. A kind of anti-stereotype that is itself a stereotype. In the end this book taken as a single entity is not generous and rather opaque, I didn’t get much out of it beside the fancy, dislocated atmosphere. Abstraction without substance. It closes, before setting up the sequel, with a trippy space journey taken straight out of ‘2001: A Space Odissey’, but here the meaning is painfully obvious and plain, revelatory of the fraud hidden behind. Containing just a promise of something more meaningful to be revealed later on, coinciding with the promise of the Tower and the conclusion of the series itself. It dresses itself as wise and resourceful but the conceit is evident. As Roland, I have no solid motivation to carry on with the hopeless and insubstantial chase. You need to entice me with with something more than mystical mumbo-jumbo and esoteric made-up terms. What’s actually there? A boy being sacrificed for ludicrous reasons, largely foreshadowed but delivered in a way so forceful that it defies every purpose that part of the story may have had. Follows a host of prophecies again grounded on nothing, neither abstract nor concrete, if not in offering bland hooks to the following book. Instead of building curiosity for the mysteries set within a context it may easily lead simply to irritation, with the man in black representing perfectly that feeling. Inhuman, inconsistent, pretentious and ridicule. His display of powers does not impress anyone and that part of the story is so inconsequential that it’s like watching animated puppets play a trippy script whose pages were thrown into the air and scattered. What is good? The sheer talent and creative pretentiousness. The lack of restraints. The outrageous metaphorical descriptions filling the pages. ‘The artificial glow from the wet rock was suddenly hateful’. All this being not only something glaringly obvious in the text, but it’s King himself explaining it. “On being nineteen”. And the book has to be appreciated in regard of this creative, unhampered recklessness. The ambition and courage that coincide with carelessness. It becomes then, in potential, a strength if one considers the series as a whole. With the latter books representing a conciliation of all this with the wisdom and moderation that one can legitimately expect to come with the mature, more broken King. Coming to terms with his own creation and trying to tie loose ends in some sort of coherence and meaningfulness, maybe. The rest is magic, or sleight of hand.